Save time and effort looking up your contacts' details with Alfred. Search for Contacts in Alfred to speed up finding a friend's phone number or email address. Type your contact's name to access their contact details. Powerpack users can also open these contacts in Alfred's Contacts Viewer to start an email, copy an address, call the contact and more. 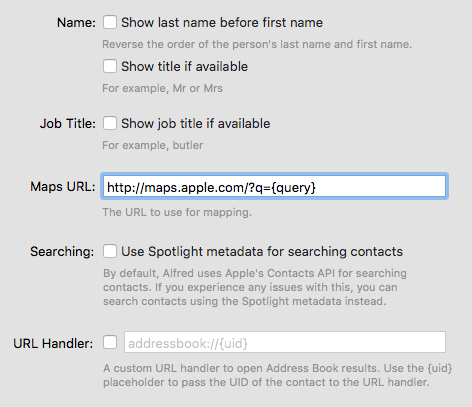 You can search for a contact by simply typing their name into Alfred's search box, provided that the checkbox for "Contacts" is ticked in the Default Results preferences. For non-Powerpack users, pressing the Return key will launch the macOS Contacts.app application with the details of your contact. For Powerpack users, the contacts will launch in Alfred's in-line Contacts Viewer. With the Powerpack, you can view your contact's details in-line and take action on them. By default, once you've activated your Powerpack license, Alfred will open the contact's details in the Contact Viewer. You can still open contacts in Apple's Contacts app by using cmd + o. When you've pressed Return and you see your contact's details in-line, use the down arrow to choose a particular contact information. Can't remember what action will be performed? Take a look at the subtext at the bottom of the Contact Viewer for details. If you'd like to take an alternative action on contacts, you can add Custom Actions in the Contacts preferences. These are triggered using Contact Action Triggers within workflows. If you're not sure how to create these custom actions, pop by the Alfred forum where fellow Alfred users can help you out. 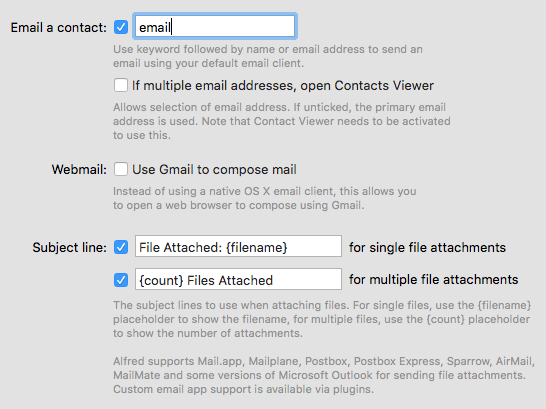 Alfred supports Mail.app, Mailplane, Postbox, Postbox Express, Sparrow, AirMail, MailMate, and some versions of Microsoft Outlook for sending file attachments. Custom email app support is available via plugins. For help using a different mail client, pop by the Alfred forum and search for your preferred email client, as many scripts have already been created by other users. By default, Alfred will save you time by automatically selecting the primary email address for any Contacts you choose. To change this behaviour, take a look in Alfred's Features > Contacts > Email preferences where you can turn on showing the Contact Viewer if there are multiple email addresses. Check the box that says "If multiple email addresses, open Contacts Viewer" to activate this feature. URL Handler: Users of contacts apps (e.g. BusyContacts) can change the URL Handler so that contacts are launched in their preferred app instead of Contacts. If you're having issues finding contacts when typing their name in Alfred, check that the box for Contacts is checked in your Default Results. If your contact's name contains accented characters (diacritics), take a look at the Contacts with Diacritics page for details. In order for Alfred to be able to search your Contacts and present them in the results, you need to grant him access to them. Here's how to grant Alfred access to your Contacts if you didn't allow it the first time.